Esmeralda and Javier: Vendors of the Week! 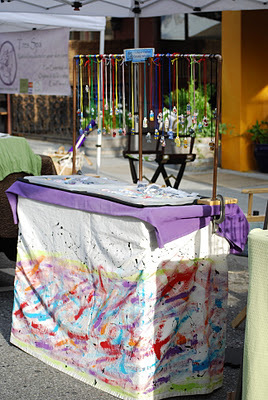 Esmeralda Padilla and Javier Martinez of ZIA are our vendors of the Week! 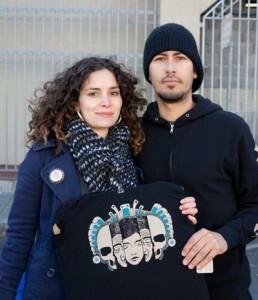 Esmeralda and Javier joined our market this year selling tees and tanks bearing their original screen prints. Javier’s art features grecas, skulls and masks. He draws inspiration for his unique art from his Mexican heritage. Esmeralda’s art features succulents and other plants and is greatly inspired by Victorian-era nature illustration. Sustainability is important to Javier and Esmeralda, so they make sure that their tops are 98% American-made and each one is hand-printed with love by the artists! This Thursday, July 5th, we’re excited to offer a special promotion featuring ZIA designs. If you purchase anything from ZIA this week at the market, you will receive a $2 credit towards any purchase at a farm stall at the market for use this Thursday or on any subsequent week. That’s right–buy some rad apparel designed by local artists, get $2 off your purchase of figs, peaches, salad mix, or just about anything else the farmers have on offer. It’s a win-win! Come meet these talented local artists this Thursday at the market! This picture of Esmeralda and Javier was taken by David Gartner as part of our Vendor Portraits Series. We may be a few days early, but come stocked with feast-worthy fare for your weekend celebration. Snag some fish from Coastside for tacos, and citrus or strawberries to serve a twist with your classic margarita. 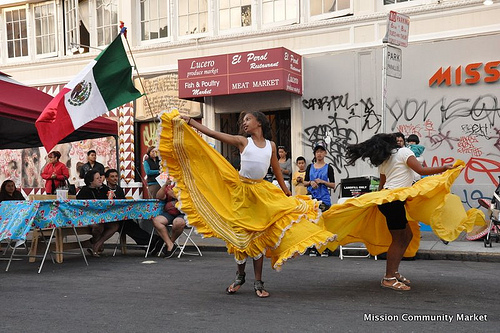 This year brings the 8th annual party in Dolores Park celebrating the 150th Anniversary of the Battle of Puebla. 10am-6pm. 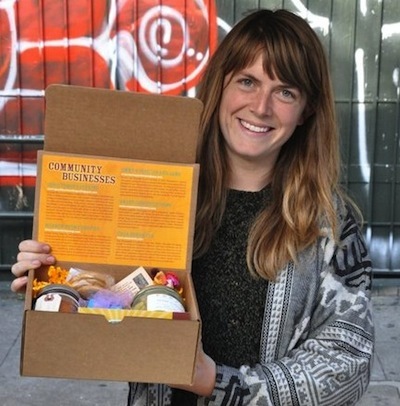 Check out SF Cinco de Mayo for more info. Final 2011 MCM is here! 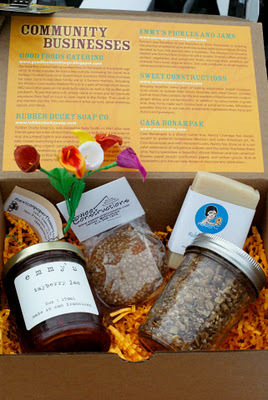 Order an MCM Gift Box, with a fun assortment from the vendors below, including Dandelion Chocolate Madgascar Bars, Arizmendi: Mission granola, Rubber Ducky Soap Co., and Emmy’s Pickles and Jams! Plus Casa Bonampak flowers and Mystic World Press storybook! All for $30. 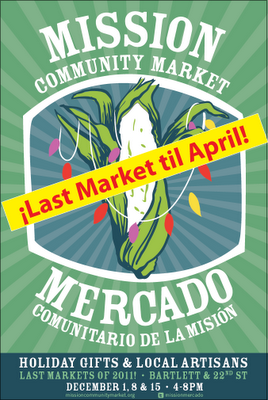 Order now mcm@missioncommunitymarket.org or at today’s market! 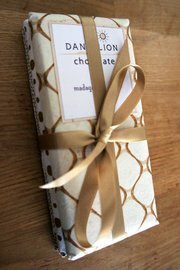 Amazing bean-to-bar chocolate. 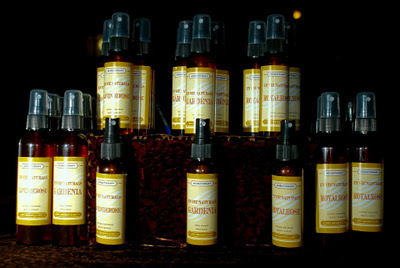 Selectively sourced, carefully crafted, locally-made. 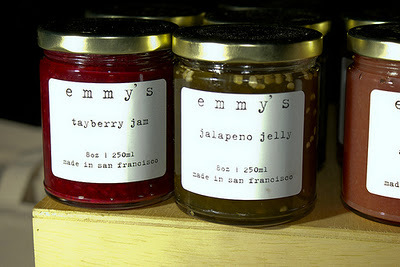 The perfectly delectable gift, savory, sweet or both! MCM fruit jammed and veggies pickled by Emmy and Jonah! 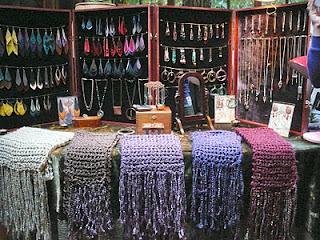 Independent designer Georgia Dwyer brings her entire set up of jewelry – metal, leather earrings, glass, stone and beads – as well as woven winter wear – scarves, gloves and hats! 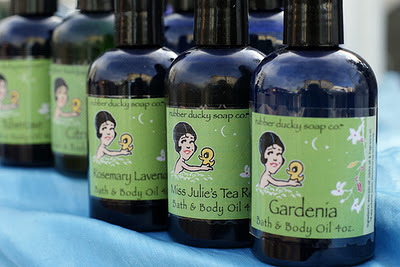 Organic soaps, limp balms, mists and body oils from locally-sourced, natural ingredients. 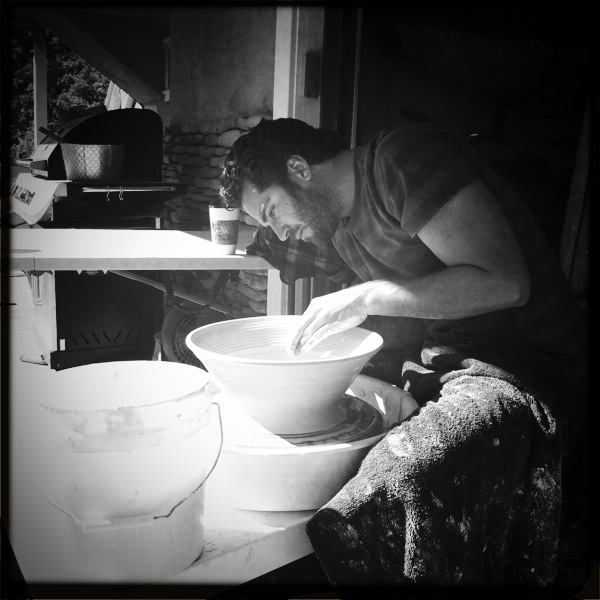 Downright amazing locally-made pottery by Jeff May. Great vases for flowers, perfect accompaniment to salts and spices at MCM, great bowls for fruit and more! One-of-a-kind hand-made ceramic whistles! Super fun designs! Great for a variety of whistling needs. Artist-owned designer company honoring latino and indigenous designs on T-shirts, hoodies and tanks. Hand-printed in SF. 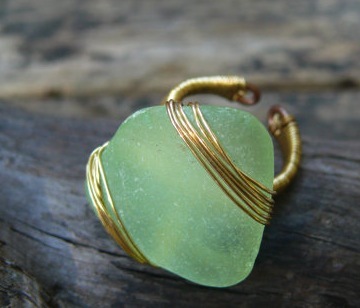 Designs are the bomb!